Eating this time of year by the season can be a little disheartening. We are pulling from things that farmers have kept in cold storage or are coming from a little further south. There is nothing wrong with that, but this is recipe is one that will help you make a very yummy and exciting dish that everyone in your family or even just you excited to enjoy those root veggies and end of the season veggies. I learned about this dish years ago when a girlfriend made it for us after we had Hayes, since then I have realized the depths this simple dish offers and how healthy it is. We make various kinds of combos of it but I love it because I can chop things quick and put it in the oven, walk away and in under 40 minutes we have dinner ready and on the table while I get some quality time with Hayes and Mike can tie up work for the evening. Everyone enjoys it and we all gobble it down and hope for leftovers the next day. Full of flavor and greens and protein it will fill you up and have you wanting more. So here is my version of this combo with alternates for nearly any similar combo and dietary restriction. 1 LB Sausage – You can use ANY sausage or ground meat you like from a vegan one to pork to lamb to chicken. Anything works and I have tried it all. * You can also add in Rutabaga, Turnips, or any other root veggies you need to use up. 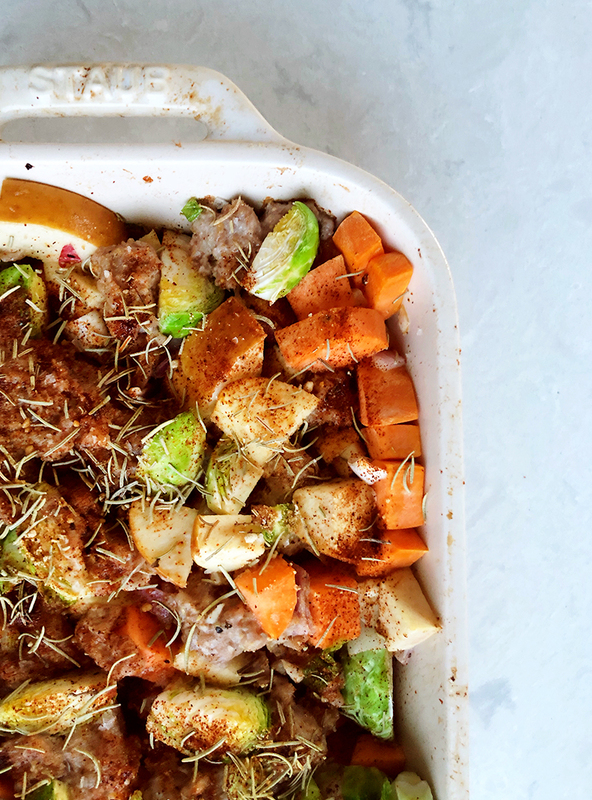 Really this dish can take any veggies that roast and it will be great! Chop all veggies roughly and as they are ready drop them in the roasting dish. Let cook for 30-40 minutes or until meat is thoroughly cooked. Cooking sausage or any ground meat is important in order to ensure it is safe to eat. Know the temp your meat should be at. Most meat thermometers have a guide on them for reference. Serve with a grain is desired and if you would like, top with your favorite fermented veggies or Sauer Kraut. That is it! Super simple and easy for a weekday meal or double it to feed a lot of people for dinner. 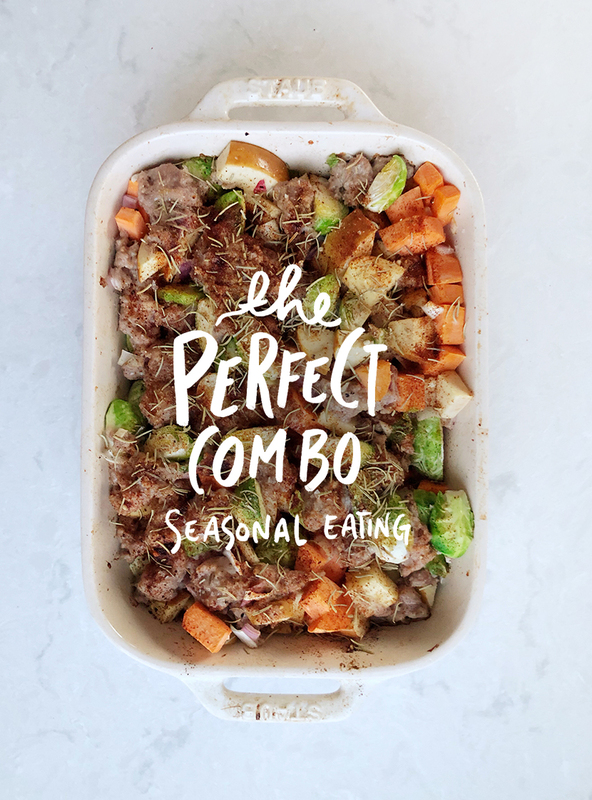 A kid-friendly and yummy meal full of seasonal vegetables you can eat with nearly any combo. A great go-to for nights you don’t want to put in much effort at all. Also, it makes great leftovers with an egg the next day too! As a MIchiganian (michigander?) i am enjoying thEse seasOnal eating posts. I would almost make this just for the leftover breakfast with an egg on it! One question-how do you prevent it from being greasy or veggies absorbing the grease from the raw meat? So glad! You can control the greasiness of it by choosing the kind of fat content in the meat you purchase. The veggies absorb the grease but the veggies aren’t raw and neither is the meat at all. This is why you use a meat thermometer to make the sure the internal temp is okay for the meat you are using. 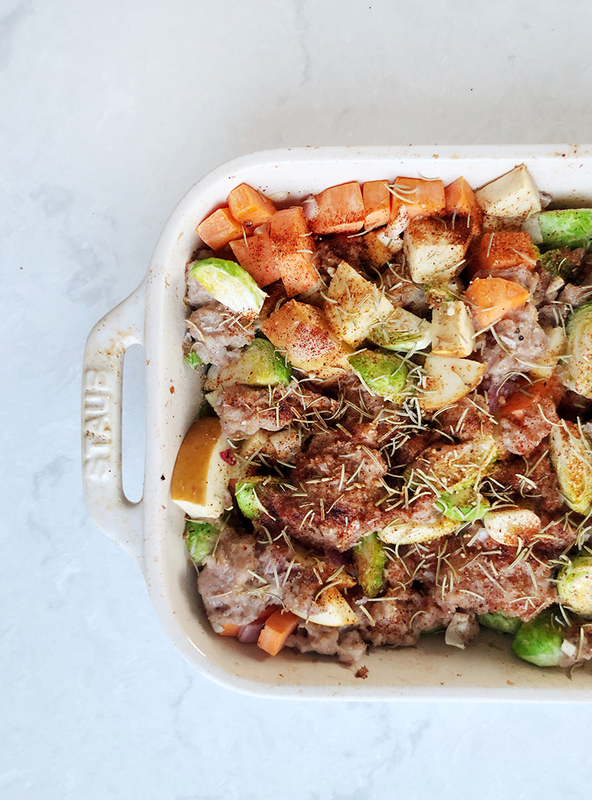 If you are concerned you could cook the veggies separately and do the sausage on the stove top. I have never found our’s is to greasy and I think the fat from the meat makes the veggies taste really great. Add chicken stock and we call this Apple Soup (when the boys didn’t like potatoes we added apples and voila). We also add a dash of cinnamon in winter to go with the sage or fennel.in the sausage. One more easy variation.